City Council members are showing signs of flexing their collective muscle given Mayor Rahm Emanuel's low approval ratings in the wake of the Laquan McDonald fallout. Aldermen are poised next week for a showdown on a couple of fronts. First, whether or not the city's inspector general should have power to police them; second, on whether or not to approve $3 billion in new borrowing. Aldermen, even those traditionally allied with the mayor, are starting to step out to take independent action, seizing on the fact that he may be politically weakened. On the first front: A group of aldermen announced their intention to use a rare parliamentary maneuver to force a vote on something that has been doing little more than collecting dust, mainly because two powerful aldermen – Ed Burke and Carrie Austin – don’t want it to go anywhere. That’s the bill that would give City Inspector General Joe Ferguson the authority to investigate their offices. Lincoln Park Alderman Michele Smith (43rd Ward) says a majority of aldermen are defying those two, and have signed onto an effort to force a vote on the matter once and for all next week. “It’s practical, it will save taxpayers hundreds of thousands a year, and it is a proven office that will bring oversight to city council,” Ald. Smith said. This would of course replace the current system where a separate legislative inspector general had almost no authority and was largely maligned for the job he did. The mayor would not say whether or not he would push for this bill – just that aldermen had to figure out some credible system of ethics oversight. 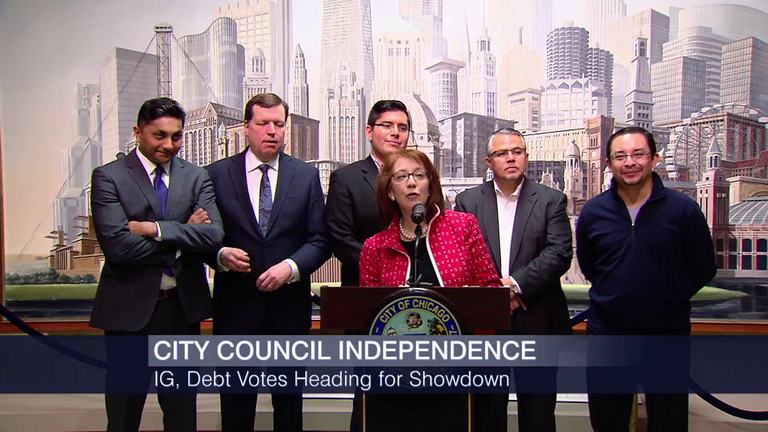 On new massive levels of borrowing – in the past, aldermen approved these right away – now, it could be a different story. This follows on a story we reported exclusively on our website last night – the mayor’s finance chief is set to go to City Council next week for a quick vote on $3 billion worth of borrowing – nearly all of the borrowing for the year in one fell swoop. This on top of property taxes and other fees that are going up this year more than $400 million dollars. • $1.25 billion of that borrowing will be general obligation debt – meaning, money backed by city property taxes – these are the bonds that are rated junk and could come in with high interest rates. • A huge chunk of this borrowing is simply to pay penalties on switching from variable rate loans to fixed rate loans, and refinancing debt coming due to longer term debt. • There is also heavy borrowing for projects at midway, water and wastewater projects – although those bonds aren’t quite as beleaguered. I asked the mayor today why he would force such a quick vote on a massive level of borrowing, given what happened with the parking meters, and given the city’s awful finances. But aldermen today are signaling they are going to put the brakes on. In another legislative maneuver, they will delay the vote and give time for the newly hired City Council independent budget expert Ben Winick to review all of it. “It would give enough time for Winick to take a look at this and do what we hired him to do and give us some advice on these important measures,” said Ald. Joe Moore (49th Ward). “What’s the rush to go ahead and put the city in position to borrow this much money? I haven’t received those answers, and until I receive those answers, I’m going to be a no,” said freshman Alderman Gilberto Villegas (36th Ward). And Civic Federation watchdog Laurence Msall says aldermen need to put their money where their mouths are and really scrutinize such a massive level of borrowing. But a lot of this borrowing involves projects in each ward – which has always been a sweetener to get fast track approval. A comprehensive list of nearly all of the planned borrowing to be done in 2016 was disclosed Wednesday by Chief Financial Officer Carole Brown.